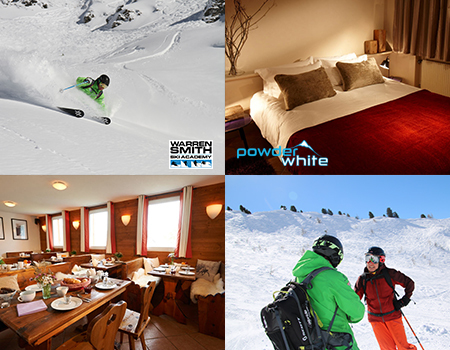 We have been in partnership with Warren Smith for many years now, where we combine our Verbier accommodation with their incredible Academy Course. 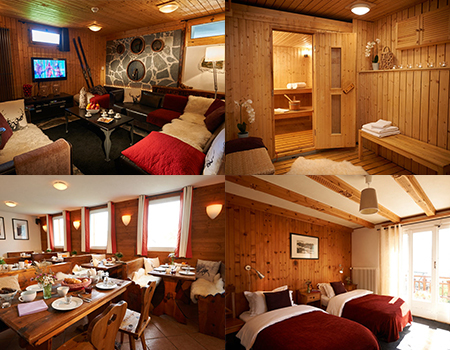 Quality chalets, for quality skiing. I will now go through these areas and give examples of how they can be improved without spending a single penny on a gym membership or equipment. Visit the Warren Smith website for more information. Just like building a house, you need to work on the foundations to ensure in the longer term it will not let you down. The same goes for nearly everyone’s skiing foundations which need to be analysed for the correct function and range to build a solid and safe biomechanical structure. By doing this will enhance performance and greatly reduce the risk of injury. a. Ski Boots perhaps too stiff b. Calf muscles perhaps too tight What is the Solution? a. Ski Boot flex check It’s important to check your boots and make sure you can flex them. The way to do it is stand up straight in them then try to make a forwards flex movement by pushing the shin against the tongue of the boot. You will feel a little resistance from the boot but it should be a resistance you can cope with and be able to dominate. If you don’t manage to flex your ski boots very well, or not at all, your ski boots may be too stiff for your body weight or skiing ability. 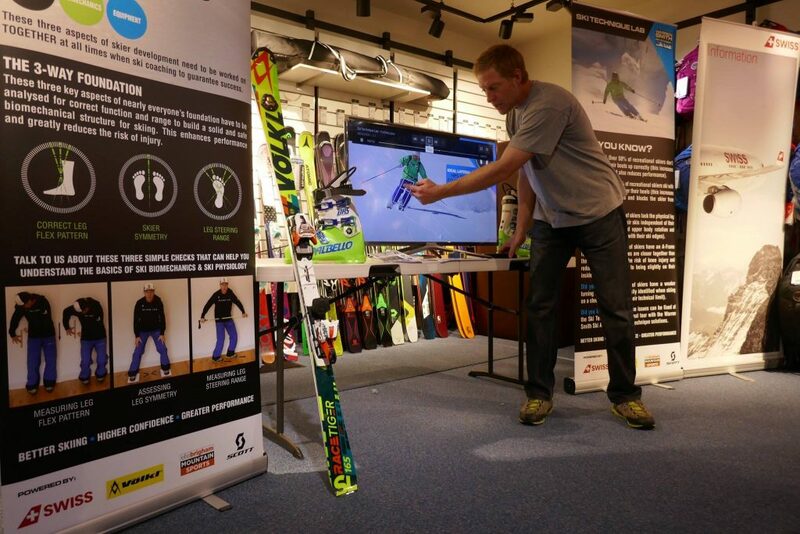 At this point, it is worth getting a ski professional or expert fitter in a shop to check them out. Ellis Brigham is where I got mine done 2 years ago and they were able to spot the problems that were affecting my boots (One foot wider than the other and not stiff enough for my ski ability). If you find that your boots do have the correct resistance for your body weight and skiing ability then it could be an issue with a range of movement in your ankle joint. 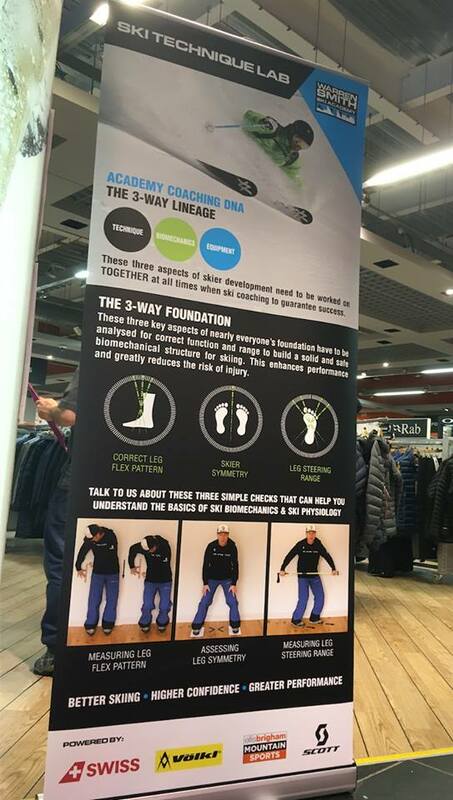 You can easily test this range with the Ankle Flex Drop Test. b. Ankle Flex Drop Test. This was the first test I did at the workshop and a vital one to demonstrate my ankle flex range which is important to prevent injury. This will be for Mogules and even those moment when you hit ice or an unbalanced surface and your ankle needs to have the flex to react to the impact. 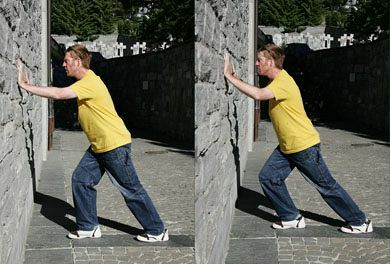 To find out if you have a lack of range of movement in your ankles, stand against a wall with your heels, backside and shoulders against it. By focusing on flexing your ankles, see how far you can drop down. You need to keep your heels on the ground and back against the wall. Your limit will be when your heel or heels lift off the ground. 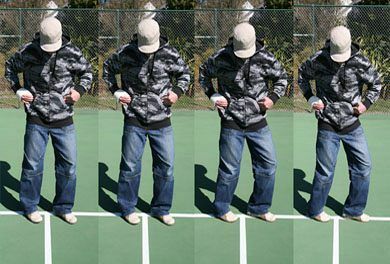 When measuring people, drop tests generally range between 6cm drop (poor range of flex) to 30cm drop (good flex). Anything less than 20cm drop you should develop your calf muscle stretches. On the day I scored 20cm, which was great but still room for improvement. 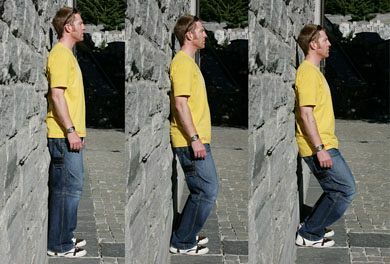 To improve the score I can simply stretch my calves by using a wall and standing with one foot in front of the other (see the image below). Flex the leg in front keeping the back leg straight and you will feel the calf muscle of the straight leg stretch. You can do this during work once your body has had time to warm up but it is best done after exercise. For me and many of the other people in the room, this was something we all could really relate too when skiing. Warren explained that most skiers ride from turn to turn with an A-frame shape in the legs. This is when the feet are wider apart than the knees (see the video here). This can happen by either the knees dropping in or the feet splitting out or both. This makes the shape in the legs non-symmetrical and the skis usually at different angles between the turns. This can cause inconsistency between turns due to the skis being tilted at different angles. b. Lateral control exercise on dry land environment To improve your lateral control you need to activate your inner thigh (adductor muscle group). It’s a muscle group that doesn’t get used heavily in sport and everyday life so a specific training routine needs to first raise awareness to the muscles and then develop your strength and skill at using them. The lateral control exercise will easily raise your awareness and develop strength and you can do it in the comfort of your own home or in an area with a polished surface. 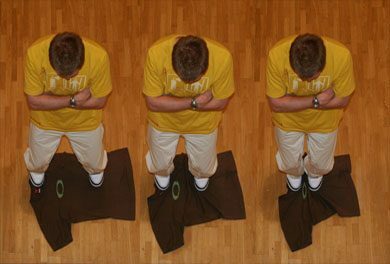 Use a t-shirt or cloth and lay it on the floor beneath you. Then with a foot either side, pull your feet towards each other. The goal is to pull your feet towards each other without your knees dropping at the slowest possible speed. If done properly you should be recruiting the gluteus maximus to assist with the strengthening of your abductors. You should be able to feel your gluteus maximus firing, by gently prodding into the tissue of your behind. Try to pull in about 10 times in a set and repeat that about 4 times. If you trained with this exercise 3 to 4 times a week you would certainly switch on control laterally in your stance when skiing and help avoid the legs dropping in at the knees or splitting away at the feet into the dreaded A-Frame. You would end up skiing with a P-Frame (power frame) and conquering all the terrains you dreamed about skiing with performance and control in your legs. We have all been there when we get told one time or another by a coach that there is to much upper body or hip rotation in their skiing. The reason for it is because this usually gives you a weaker edge support in the turn and poor body positioning over the skis. The Result – A vulnerable and weaker set up for overall dynamic balance. Upper body or hip rotation is usually more apparent in one direction. Steering needs to come mainly from the legs with the ball of the thigh bone rotating inside the socket joint of the hips. This allows the hips to remain generally facing in the direction of the fall line. In most cases, skiers can step their feet around approximately 50 or 60 degrees across either side from the fall line. This means that when you steer from turn to turn and the steering of the skis is greater than say 50 or 60 degrees, the upper body will start to rotate as the skis try to achieve 75 degrees and 80 degrees of angle across the fall line (this is typically what’s needed of steeper slopes). What is the solution? a. Yoga Attend a yoga workout class or go on you tube for free videos. You can normally find some good deals on Groupon for 6-10 lessons and then after that, you can either continue or take it home and do it yourself. I have found yoga not only good for my skiing but everyday life movements. b. Static leg rotation dry land exercise This exercise below helps improve your awareness of your leg steering range and capability. Once you can measure you range off of snow you’ll know what you’re capable of on snow. You’ll also be able to identify the turn direction that has a lack of range of steering. No matter what type of turn you’re making, you nearly always want the steering to come mainly from the legs. If you’re getting it right, the ball of the thigh bone rotates inside the socket joint of the hips. From this correct way of steering, you’ll a get stronger edge hold in the turn. Try to make your turn shape like semi circles meeting semi circles, S shaped turns as opposed to Z shaped turns. In the Static Leg Rotation exercise test the range at which you can steer your legs without rotating your hips. 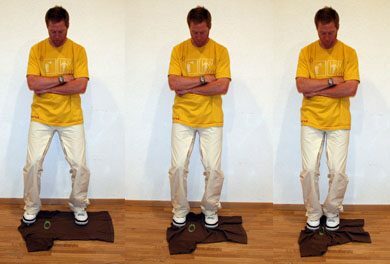 To do this simply stand with your hands on your hips bones. 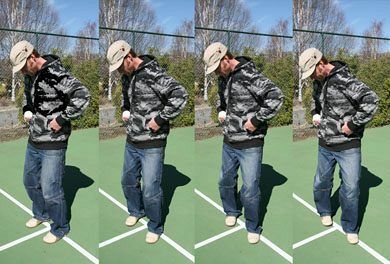 Use your hands to stabilise your hips and start to step your feet around. Keep stepping until the point where you feel you can’t step anymore without your hips moving around. This is your limit. When you get to your limit try to measure the degrees of steering range across the fall line from zero to 90 degrees. In an ideal world for skiing, you would want to be able to step around 90 degrees in each direction. This would mean that you can steer in each turning direction without any tension in the hips stopping the upper body from rotating. The average in most skiers is to step around to approximately 50 or 60 degrees. It’s common that most people have one side they can step around more than the other and this is usually a starting point for identifying the weaker turning direction even before a skier puts their skis on and is usually an indication of either past injury or misalignment in the pelvis. Make a note of your stepping around the range and try to better it over several weeks of monitoring. c. Try to finish your turns off and make the turn shape like semi circles meeting semi circles, S-Shape turns The result is an increase in the range of leg steering allowing the skier to steer to greater angles without the upper body rotating, leaving the skier with a stronger edge hold and greater leg steering strength at the extremities of each turning direction. So there you have it. Just a little bit of wisdom from Warren Smith and his team from their UK tour. 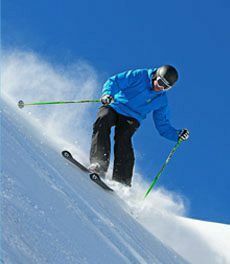 For more information on ski fitness and biomechanics information click here. If you would like to know more information about the course or Catered Chalets in Verbier, click below. I hope you found this as useful as I did and if you have any questions, drop us a message on Facebook. Next articleNeed A (Ski) Lift?